Finally, the New Horizons team has their entire “pot of gold.” 15 months after the mission’s flyby of the Pluto system, the final bits of science data from the historic July 2015 event has been safely transmitted to Earth. “The New Horizons mission has required patience for many years, but we knew the results would be well worth the wait,” New Horizons project scientists Hal Weaver told me earlier this year. Because of New Horizons’ great distance from Earth and the spacecraft’s low power output (the spacecraft runs on just 2-10 watts of electricity), it has a relatively low ‘downlink’ rate at which data can be transmitted to Earth, just 1-4 kilobits per second. That’s why it has taken so long to get all the science data back to Earth. Because it was a flyby, and the spacecraft had just one chance at gathering data from Pluto, New Horizons was designed to gather as much data as it could, as quickly as it could – taking about 100 times more data on close approach to Pluto and its moons than it could have sent home before flying onward. The spacecraft was programmed to send select, high-priority datasets home in the days just before and after close approach, and began returning the vast amount of remaining stored data in September 2015. New Horizons is now over 3.1 billion miles (5 billion km) away from Earth as it continues its journey through the Kuiper Belt. That translates to a current radio signal delay time of five hours, eight minutes at light speed. The science team created special software to keep track of all the data sets and schedule when they would be returned to Earth. New Horizons was about 3.7 million miles (6 million kilometers) from Pluto and Charon when it snapped this portrait late on July 8, 2015. 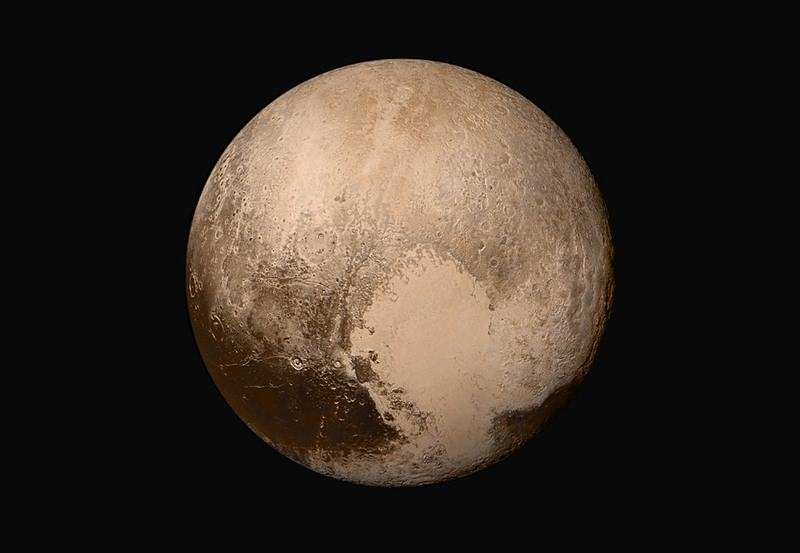 The final item that was received was a portion of a Pluto-Charon observation sequence taken by the Ralph/LEISA imager. It arrived at New Horizons’ mission operations at the Johns Hopkins Applied Physics Laboratory (APL) in Laurel, Maryland, at 5:48 a.m. EDT on Oct. 25. The downlink came via NASA’s Deep Space Network station in Canberra, Australia. It was the last of the 50-plus total gigabits of Pluto system data transmitted to Earth by New Horizons over the past 15 months. Bowman also said the team will conduct a final data-verification review of New Horizons two onboard recorders before sending commands to erase all the data on the spacecraft. New Horizons has more work to do, so erasing the “old” data will clear space for new data to be taken during its Kuiper Belt Extended Mission (KEM). The spacecraft will do a series of distant Kuiper Belt object observations as well as perform a close encounter flyby with with a small Kuiper Belt object, 2014 MU69, on Jan. 1, 2019. You can see all of New Horizons images at the New Horizons/APL website.